I've an 8.2 2-node vsim, and I installed System Manager 3.0RC1, under Windows 7 with 64-bit JRE7. When I start system manager, i add my cluster to the inventory and then double click to login. I then get a popup saying 'Unable to load storage information from the configuration file' The details of which are below. Any ideas, I have tried what is suggested below, but still not working? Thanks. Did you get an answer to this? I'm having the same problem. Please let me know are you able to coonect the array trough telnet/ssh ? if yes, try to uninstall the OSCM and reinstall it and add the array agin. and also check the ssl configuration. If this does not solve this issue, do let us know. I've got this problem happening on a Win7 system and it is not being fixed by any of the suggested notes in this community I can see. I'm running on the NetApp corp Win7 image as a VM under Fusion on a Mac. FWIW, SysMan 3.0 for OS X is working fine. It developed the same problem but using the Java control panel to clear cache (Delete Temporary Files ...) seemed to clear the problem for it. Is there some small hidden file I could delete and get rid of this situation? About an hour after my post above I figured out my problem (sort of). This was a Win7 system running under VMware Fusion. Fusion has a feature setting that lets the guest VM share certain classes of folders with host machine (OS X). 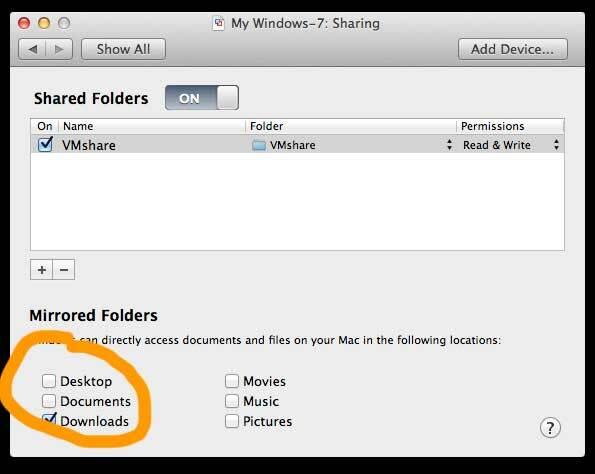 I normally have a specific folder I share with the host (VMshare in my case, see below) I had recently enabled sharing of 'Documents' and 'Desktop' and 'Downloads' also. I believe something about the interaction of sharing the 'Documents' folders (or Libraries in Win7 terms) was causing the problem. Below is a screen shot of the Fusion Sharing Setup window ... the orange circle highlighting the options I turned off which cleared up my problem. I turned off both Desktop and Documents sharing but I think 'Documents' was causing the problem. You cannot launch System Manager if either the configuration file or keystore file is corrupted. reenter the credentials after launching System Manager. 2.Ensure no Java processes related to System Manager are running. 4.Copy the contents of SystemManagerBackup.config to SystemManager.config. Subsequently, when you launch System Manager, a new SystemManager.ks file is automatically generated. I had the same issue on a 2012R2 install. To fix the issue I just added "http://127.0.0.1" to the local intranet zone sites.